Here's one of the superb new online slots game from NetEnt that you can play. 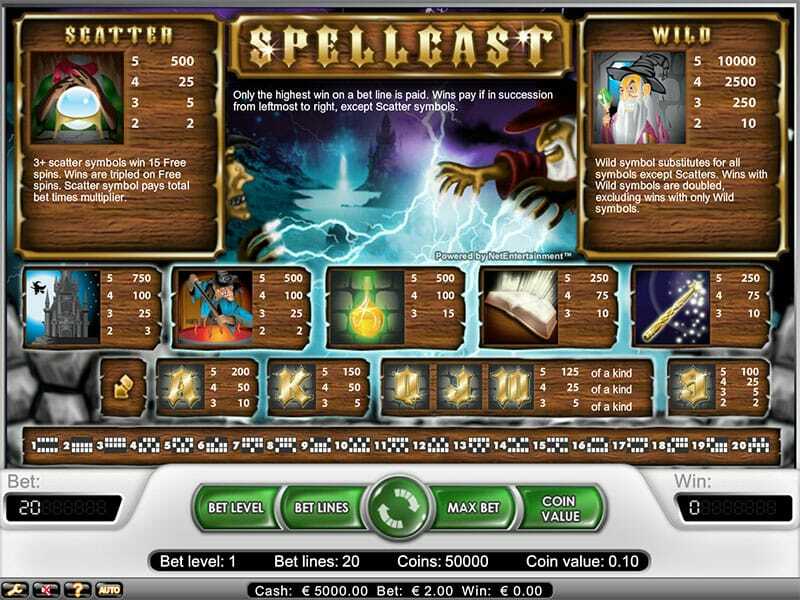 This magical, mystical online slot game takes you into the fantasy world of witches and wizards. 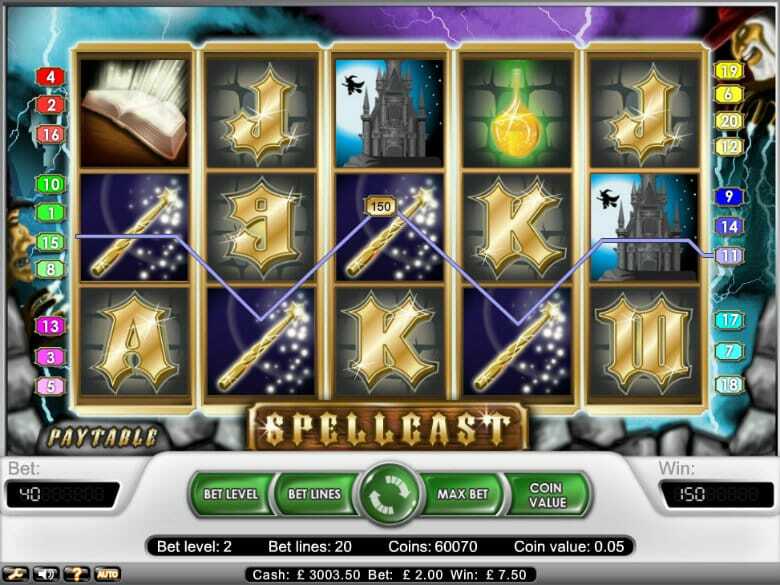 Complete with a spookily immersive atmosphere thanks to the Slots Games visuals and soundtrack, Spellcast will keep you on the edge of your seat from start to finish! NetEnt is the developer behind big titles such as Dracula, The Invisible Man and Bloodsuckers. Having supplied games to over 170 online casino operators, they are one of the most respected developers in the industry. Since first establishing themselves as a company in 1996, they went on to open their first online casino in 2002. They’ve gone from strength to strength since then and even clinched three separate awards at the 2015 EGR B2B Award (Slots Provider of the Year, Mobile Provider of the Year and the Innovation for Mobile award.) If you love promo's, get the best slot bonuses in the UK today. The game has five reels and twenty pay lines. In terms of limits, you can use a minimum of one coin and a maximum of four coins in this game – this is called the bet level. There are also up to four different bet levels available to choose from. A maximum bet at the maximum available coin value would be 40.00. The lowest minimum bet possible at the lowest possible coin value would be 0.40. You can automatically place the maximum bet with the Max Button. You can stop the reels at any time by pressing the big green button. Remember, the higher the stake you bet per spin, the higher the potential pay outs! There are two types of symbol available in the game: the playing cards and the special symbols. The playing cards stick to the theme of the game as they are designed with the gothic aesthetic in mind and have gold characters on them. These symbols are fairly low value but will appear on the reels more frequently. The other symbols take the form of a wand, a book of spells, a glowing yellow potion, a witch stirring her cauldron and a haunted mansion. These symbols are a higher value and therefore they’ll appear on the reels much less frequently than the playing card symbols. There are also another two ‘special’ symbols: a crystal ball Scatter Card and Wizard Wild Card. There’s only one bonus feature in this game. You can trigger the Free Spins round by collecting three or more of the crystal ball Scatter Cards anywhere on the slots. Free Spins mode gives you 15 more free spins on top of the prize money you already receive for getting matching symbols. Any winning combos you land also multiply your total winnings by three. Spellcast’s spooky soundtrack and gothic visuals help to create an authentically ghoulish gaming experience. The different options and betting levels offer plenty of variance to the game despite there only being the one bonus feature in the form of the Free Spins round. This is a casino game to suit all kinds of casino players. It’s simple enough for beginners to pick up while also remaining interesting enough for more experienced players to get involved.